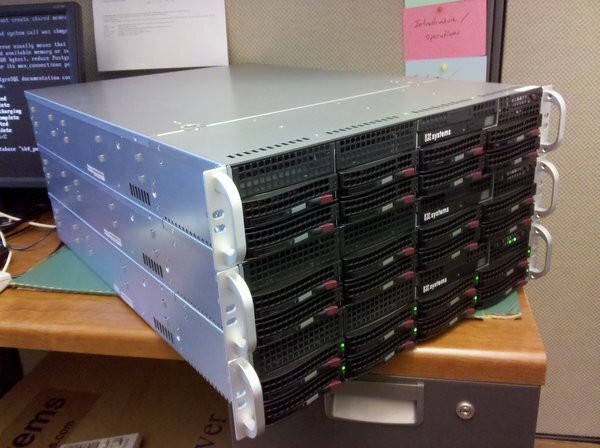 We received our shiny new servers from iXsystems (http://www.ixsystems.com). iXsystems "strives to provide the highest quality storage solutions, custom rackmount servers, pedestal servers, and appliances running FreeBSD, NetBSD, OpenBSD and various versions of Linux such as RedHat, SuSE, Slackware, and Debian." We went with a FreeBSD specialist vendor to eliminate the time required to track down hardware compatibility and to gain access to the reportedly excellent iXsystems technical support. We ordered the 2U Jupiter server which is built on a SuperMicro platform. I wanted 8 drive spindles for storage system performance and 3.5-inch drives to keep overall price low. Some vendors have moved their 2U servers exclusively to 2.5-inch drives or their high performance SAS drives are obscenely expensive, so iXsystems met our specs and also came in a few thousand dollars cheaper per server than the larger vendors such as Dell or HP. Initial casual benchmarking of the storage system and processor indicate that the machines are very fast. Disk i/o performance is fabulous. I have not yet found a load test I can throw at the machines to make them unresponsive. iXsystems support was responsive to my initial questions. The only surprises had to do with my expectations. No extra software was pre-installed on top of FreeBSD. I expected to see RAID controller management software as part of the build. I inquired with iXsystems and they indicated that they would happily install additional software such as the RAID management software on future orders if requested. I can see that some customers would not want any "extras" on a clean new system. We are still staging the new servers, but I believe they will give a significant performance boost to our development of data warehouse / business intelligence systems. If I were to change anything about the systems we ordered I would probably get a slightly faster CPU. Some of our software pipelines / test suites are single-threaded and would have benefited from additional clock speed.